. إن الخدمات الممتازة وحسن الضيافة العالي في Club Fiji Resort تجعل إقامتك تجربة لا تنسى. لضمان راحة ضيوفه، يقدم الفندق الخدمات التالية: تسجيل وصول/خروج سريع, تخزين الأمتعة, واي فاي في المناطق العامة, صف السيارات, خدمة الغرف . بالإضافة لهذا,تتضمن كل غرف الضيوف مجموعة واسعة من وسائل الراحة . بعض الغرف توفر حتى غرف لغير المدخنين, مكيف هواء, خدمة الإيقاظ, مكتب, ميني بار لإرضاء أكثر الضيوف تطلباً. صممت خدمات الاستجمام في الفندق والتي تتضمن شاطئ خاص, مسار جولف - ضمن 3 كم, صيد السمك, تدليك, حديقة لمساعدتك على الاسترخاء والراحة. إن Club Fiji Resort هو مكان مثالي للمسافرين الذين يتطلعون إلى الراحة والاستجمام في نادي. Not a great experience. Felt like they want to charge for everything from internet (charge per hour) to breakfast (apparently the inclusive breakfast is continental and u need to pay extra for eggs etc). Also, dont try dinner at the hotel. They had a "mongolian buffet" dinner where u can only fill in once, with a meat bowl in the size of a sauce bowl. The room was comfortable, but still overpriced for what you get. Great spot. A little pricey for how dated it is but I do think the daggyness added to its charm. The rooms are large and clean. Comfy bed. Great shop of locally made stuff on site. Fabulous menu that actually has Fijian food on it... and it was delicious. Bar is a little pricey but you get that at resorts. The only con was the driver who berated us like naughty kids the whole way to the resort as he said he drove around for ages while we were standing around talking, which we hadn't been. Also said we weren't supposed to be picked up anyway as we flew domestic (we had no idea).Not sure what happened or if it was just a reaction as my hubby called the resort to find out why he was late. Anyway it set a bad tone but once we got there everyone was lovely and we adored the stay. Will stay next time. We stayed here at the beginning of our trip and weren't all that impressed. 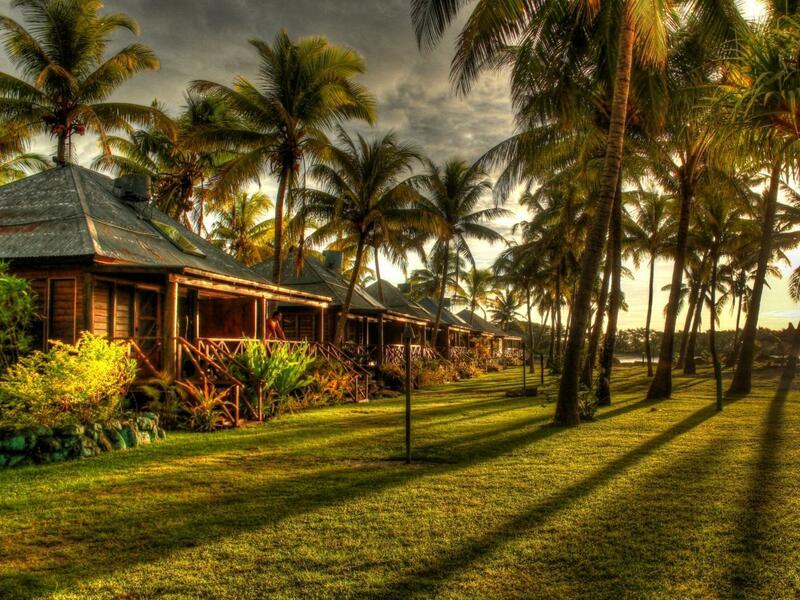 Then we traveled around Fiji for 2 more weeks and we didn't know how good we had it here! We paid a lot more money for a lot less elsewhere in Fiji. The bungalows are spacious, have AC and a fridge, the pool is decent, the restaurant pretty good, free breakfast is OK but good in comparison with other places at this price. We were on a pretty cheap deal in the off season so not sure about peak season prices. The downsides are that it's not walking distance to anything, and the beach is not that perfect Fiji beach with blue water. But for a place to relax nearby the airport, with relaxing hammocks and cabanas on the sand, I'd recommend it. The pictures outside look amazing. but the bures are old and run down. I dont understand how this place got 4 stars. my first bure had dead cockroaches and the minute i turned around there were mosquitoes nd bugs in my bure. I'm guessing the screens in the windows had holes! the manager was helpful and told me there's only one other room available. i said that's fine but you would need to give me a refund. the next bure given to me was clean and closer to the reception area. the amenities were still old towels and old bathrooms. just glad it was working. additionally I noticed that the water would run hot to the point of burning. there should be a stop gap in case kids are using the shower. I stayed at Club Resort with a girlfriend for a week, it was our third visit and we found it to be very relaxing, very beautiful setting, with wonderful staff. We arrived in the afternoon and the shuttle was waiting to take us to the resort. We were upgraded to a beachfront bungalow which is definitely worth having. It is about 15 mins drive from the airport situated beside the ocean. 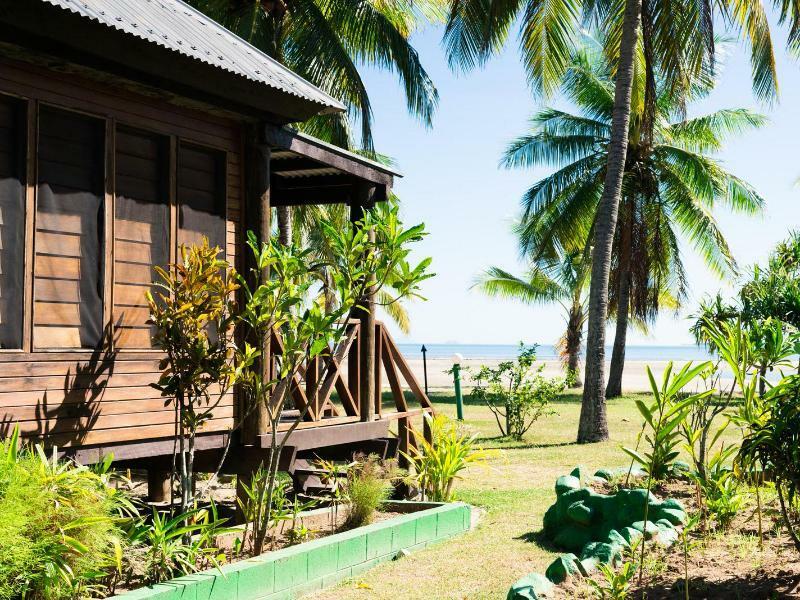 It has very authentic Fijian bungalows , with lots of lounges, umbrellas, and hammocks . Breakfast was more than adequate, having your choice of eggs made especially made to order. Omelettes were delightful. There was a small selection of cereals, juices, bread, , hot dishes, fruits and muffins. JBs pizza restaurant absolutely beautiful, as were the many cocktails available at each of the 2 restaurants at the resort. They have special theme nights of Mongolian BBQ, Mexican,and Teppanyaki. 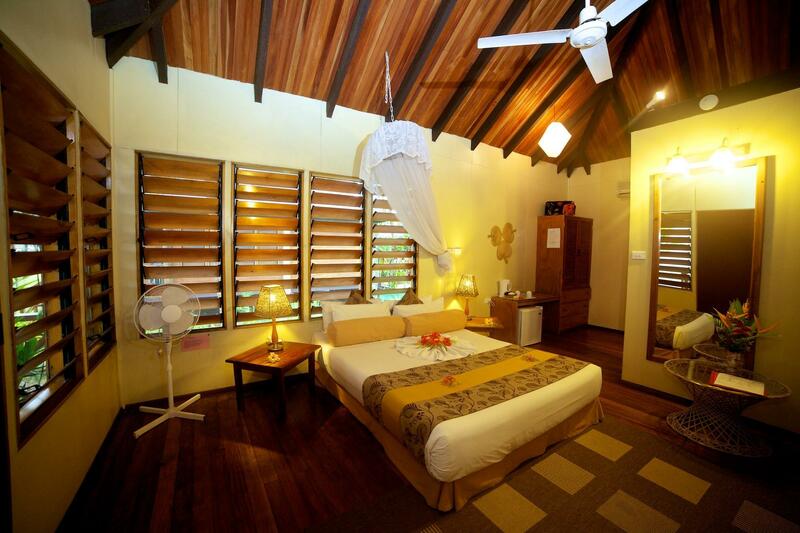 The bungalows were very clean, and furnished beautifully. The pool had just been renovated and was absolutely beautiful. Joel the manager , who is an Australian is absolutely amazing, listening to everyones views and improving on things everyday. There is a tour desk with a great choice of tours. The massage girl does an amazing massage, loved it. Anyone staying could make it as relaxing or as busy as they want. We would have no hesitation at all in going back again. I booked at Club Fiji for 1 night at the end of my week holiday in Fiji as it's conveniently close to airport. I was pleasantly surprised that the reasonably priced hotel is a great beach club resort. The staff was very friendly as most Fijians, and the young assistant manager "Joel", who is the owner's son, is a very smart Queenslander that really too eager to serve and please customers. I promised to go back to their resort, not only on the last night before going back home, but a real good value beach holiday. Thanks guys for every thing, and especially thanks Joel for looking after us. Pool is modest but good, food the same, bure was fun, watch out for falling coconuts. Some people will be disappointed with the beach, especially at low tide. There is broken glass and rubbish, but it's the cheapest bure hotel on the island and easy to get to all the attractions. We stayed a night here before leaving Fiji Room was clean, location bit far from all the restaurants etc but close to the airport, swimming pool was good and good selection of food however quite expensive for the quality The staff weren't very helpful or friendly, didnt feel very welcomed and had to go find staff to take order and order dessert no one asked how the meal was or bothard to come round and take dessert order i had to go find staff who were just sitting down Complimentary breakfast was below average toast, canned fruit and two spreads for the toast, tea and coffee and not very nice juice If you are just needing one nights accommodation and dont care for much then stay here. If you just want to relax with no TV, no work then this is the place. Ensure that you do not have crying babies next door as there is no noise proof. Hotel does not have trolleys to carry your luggage to your Bure. Someone has to carry it to your room but the staff are very helpful. This place is beat up, isolated, and without good food. Not sure if it’s seen better days or if this is how it’s always been, but I was quite disappointed at what I received for the price. The staff is highly disorganized, leaving you waiting for 30 minutes at a time to resolve questions or issues. The room’s toilet didn’t flush properly, nor did the common area toilets. The room had lamps that didn’t work and the water was either scalding or freezing in the shower and sink. The restaurant food is okay, but way overpriced. The pizza restaurant’s pizzas are seriously bad. Getting rides organized with them to and from the airport was a major hassle and it was never when we needed, but whatever was convenient for them, even if we were inconvenienced by an hour or more. Would not stay again. The breakfast options are really limited and you have to pay for wifi. You will only be able to access wifi at lobby area. The location is not so convenient. We got a great deal in the off season, we liked it better than the other places in Wailoaloa Beach. Awesome budget accommodation. We travelled with 3 children (ages 2, 8 & 16); basic amenities, good location, great staff members. Great little place for a few days before we headed out to our next resort.